N06 M17 ; More examples..........!!!! N01- Program in absolute co-ordinate system , all dimension in mm , feed in mm permin , feed rate 100 . N02 - Referance point command where tool at X0 Z0 . 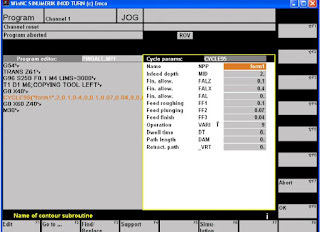 N03 – Tool change command , select tool no 6 and offset diameter 01 . N04 – Spindle on clockwise at speed 1000 rpm. N05 – Coolant ON . N06 – Rapid command to near to the job and ready for machining . In these cycle we performed radis cutting , turning , chamfering and taper operation . N08 - Referance point command where tool at X0 Z0 . N09 – Spindle stop . N11 – Tool change command , select tool no 2 and offset diameter 01 . N12 – Spindle on clockwise at speed 600 rpm. N13 – Rapid command to near to the job and ready for machining . PIT - PIT means pitch of threads is 1.5 mm . MPIT - It is also pitch of thread but it takes whenever if not given ,it is standards threads pitch from 3.5 to 60 . To produce metric cylindrical threads . But in these program we don’t need MPIT , we take zero . SPL – Starting point of thread along Z – axis , we take -16 . FPL - End point of thread along Z – axis , we take -55 . DM1 – Diameter of thread at starting point is 32 . DM2 – Diameter of thread at end point is also 32 .
hence we take zero . 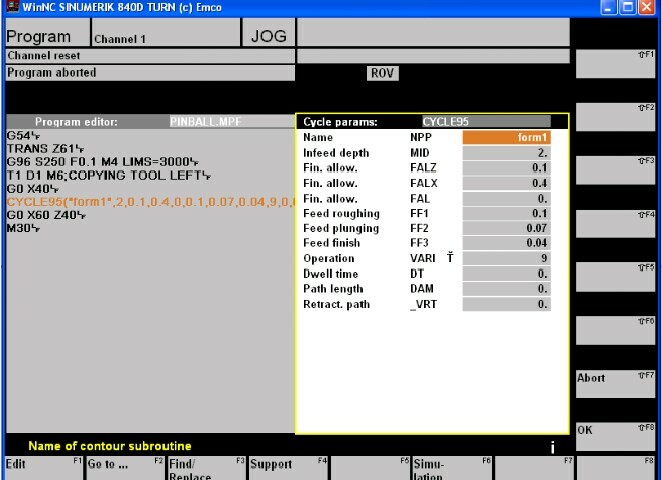 ROP - After threading ideal run path for Z axis , we take zero . FAL – Finishing allowance for finish cut , we take 0.05 . IANG – Thread angle , if angle is 60 we take always half of the angle 30. NSP – Used for offset at starting 10 , 20 , but we naver take offset in these program hence we used 0 . NRC – No. of rough cut , its deped on depth of cut . We take 12 . NID – Finishing cut at last . we take 2 . 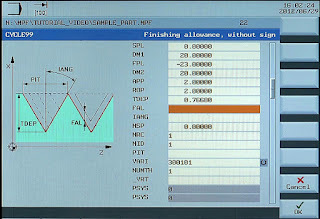 VARY – In computer panel there is four option for thread , generally we select for external threading No. 3. NUMTH – No of thread cut this is depend upon single start and multi-start . We take 1 . N15 - Referance point command where tool at X0 Z0 . N18 – Main program end . RAM.SPF – Sub program name . N01- Tool at linearly where X0 and Z0 . N02 – Outer radius 15 , where X30 and Z-15 (Radius cutting ) . 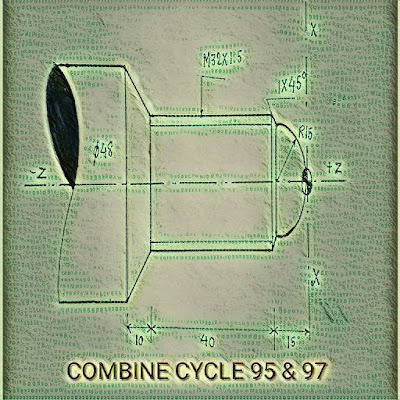 N03 – Tool moves linearly X30 and Z -16 ( Chamfering). N04 - Tool moves linearly X32 and Z -55 ( Turning). 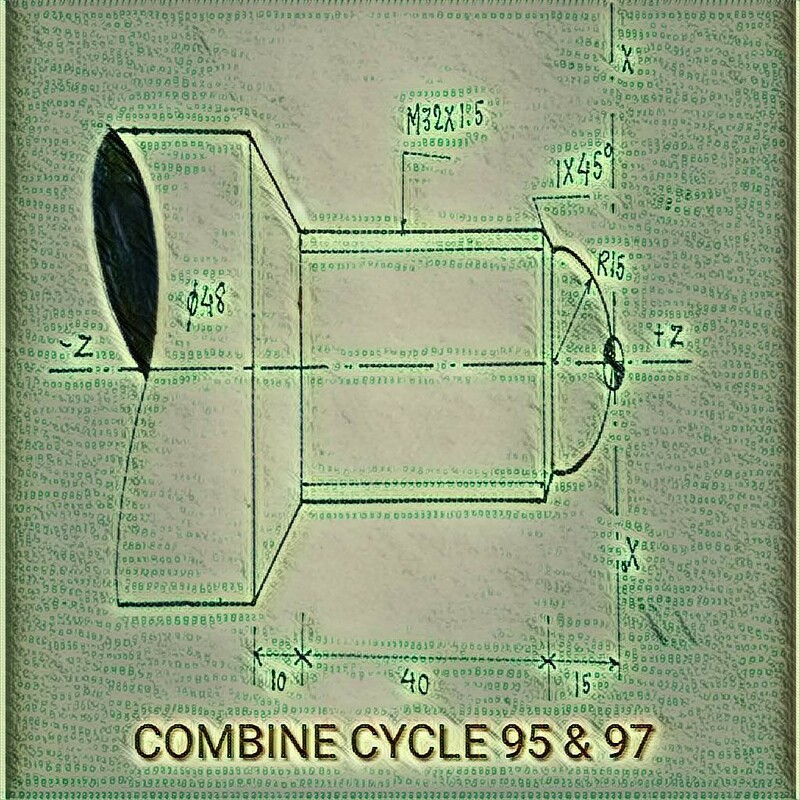 N05- Tool moves linearly X48 and Z -65 (Taper turning ). N06 - Sub program end .